Today Mother Church celebrates the feast day of St. Robert Bellarmine. He was born in 1542 in Italy. When he was 18 years old, he became a Jesuit and studied at the Roman College. People knew him to be extremely intelligent…and not surprisingly, he ended up teaching at Louvain and was the first Jesuit professor there. The man was short, so short that he would stand on a stool in the high pulpit of the church. I miss those pulpits. When he was 28, he was ordained a Priest. 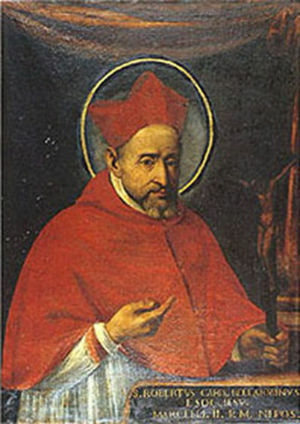 He became the rector of the Roman College 22 years later and then was named cardinal when he was 56. In 1602, when he was 60, he became archbishop of Capua. And then a few years later, three to be exact, he was called upon to defend the Church in Rome against heresies, one of which had to do with Galileo and his teachings. But it just so happened that Galileo was a friend of St. Robert, which made the situation quite uneasy. He told Galileo that his theory that earth revolves around the sun was counter to Scripture. When Rome told Robert he had to “admonish” Galileo, Robert simply told him to not put forth any theories that were not proven. But this man served Mother Church well in the time of the Protestant Reformation. He guarded the deposit of faith well. He authored two catechisms that contained the substance of the faith. He is the patron saint of canon lawyers, canonists, catechists, catechumens, and the Archdiocese of Cincinnati, Ohio. to defend the faith of your Church. may we always rejoice in the profession of our faith. This entry was posted in Reflections, Saints. Bookmark the permalink. ← The last high school seminary: "At any age, God can plant the awareness of this vocation"